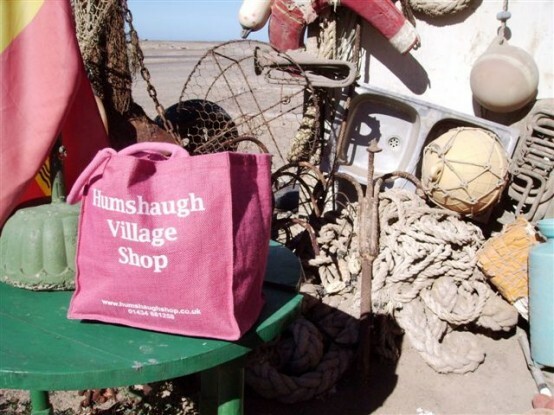 The hunt is on for the most interesting, exotic, bizarre or downright silly photo of a Humshaugh Village Shop bag. The stylish jute holdalls, which have been available since October for a modest £3.99, are rumoured to have travelled all over the world. But so far the only photographic evidence we have is from the Jacots. Their picture was snapped on the beach at Puerto de la Cruz on Fuerteventura in the Canaries. Even the kitchen sink got in on the shot along with other items of flotsam and jetsam. In fact, if it wasn’t for the sunshine, it could easily be Tynemouth. We’re expecting a series of pictures from various residents who are sweltering in Australia and New Zealand at the moment but distance isn’t everything. We’re hoping for a big collection of witty pics from wherever you happen to be showing off the proud slogan “my bag … our shop.” There’ll be a display of them in the shop and a gallery on this website so get snapping. Anyone going to Bagshot?